Love bombing is an explosion of contact. Contact is how the life-hack happens. Contact is how sociopaths get inside our lives. Love bombing is an explosion of rapid fire attention, flattery, contact. All sociopaths are alike. They think they’re unique and über special. They are special for sure – special cases of wrong-doing, life-ruining parasites. There are strictly 5 stages of true love scam. It all begins the first millisecond a sociopath makes contact with a person. Any person. The sociopath looks into the crowd – with one thought: which person will serve my needs. The sociopath assesses for “scamability.” The assessment covers whether someone represents what the con man wants – and how easily he might get it. The fact is: every single amazing one of us can be scammed. Every one. Even the cynic. No one is exempt. It’s really a matter of life circumstances – not position in life, but more profound things. Unseen conditions: timing, our state of mind, awareness, our self-perception, our internal life condition, our mood and deep inner-realm things in the moment of meeting a sociopath. And it matters greatly if we’re attracted to them or not. If we aren’t they overlook us. There’s nothing wrong with a person who’s scammed. There is everything wrong with the sociopath. We are not weak. We are not stupid. Our humanity is what sociopaths take advantage of. This is why anyone and everyone has the possibility of being conned. – This does not equate to: all people will be scammed. No. Everyone will not be conned, played, or true love scammed. No. Definitely not. This first nano-second of contact determines all. All begins with a sociopath’s number one tactic: assessment. Sociopaths are looking for those who are open, secure, up for an adventure, looking for something new in their lives, ready to make changes, optimistic, and have had loss, understand grief, are forgiving, loving, believe in second chances, believe in love, and invest in and treasure friendships and relationships. The initial moment of contact: Tactic number, one the assessment. Sociopaths test every person they meet for scamability. When a love bombing sociopath meets a person who is in the exact state of mind and prime moment in life to be hooked and reeled in as fresh prey a click factor registers. That’s the hook. It’s attraction. It’s kismet. It’s “meant to be.” (There kinda is no such thing, but that’s another article.) They do make sure we “feel it.” – They do this to every one of their targeted women or men — there are many of us all at once. They yank the line and reel us in with: love bombing. A sociopath clings to a new victim like a fly to a horses tail. They stick to us like glue. They are there every second. They text, call, FB message, chat us up, take us out, hang, flatter and flirt non-stop. Love bombing galore. There’s intense immersion right away. Their intensity towards us continues or lightens depending on the love bombing sociopath’s success during the first few days. 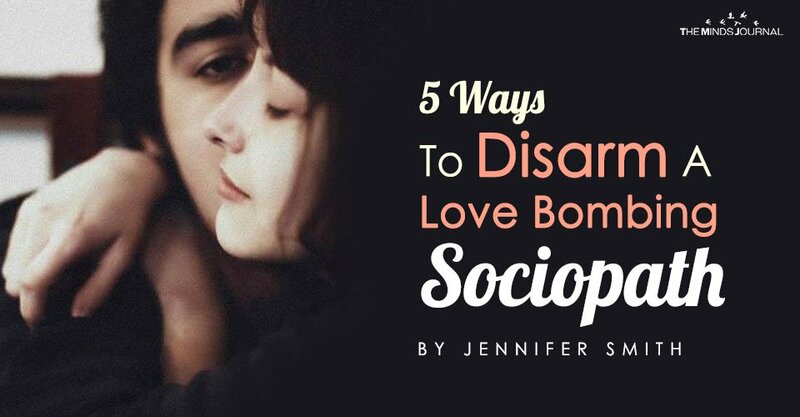 Love bombing sociopaths aren’t “loving” — they’re hunting. That’s the very essence of a sociopath. If we aren’t sufficiently responsive or conditions are wrong they move on. The more we know about them the better. Sociopaths look for human good-hearted people. Sociopaths are monsters. They practice their entire lives to seem normal to fit in. They want us to trust them so they can use and take. They lie and scam and take – from anyone and everyone. In love, in business in the religious realm, in every arena and in every moment of every day, every where they go. Realize what we’re up against: a being with an entirely different brain than ours. They do not think like we do. They don’t experience any human interaction in the way we do. My god, you are a TOXIC, uneducated piece of work. No, all sociopaths are not alike. This is quite literally one of the least accurate statements you could have possibly made about Antisocial personality disorders. This is why education and awareness about mental health are important. Dear readers: YOU ARE READING AN ARTICLE WRITTEN BY A MENTALLY INSANE LUNATIC WHO BELIEVES IN FAIRIES AND REPTILIANS! IF YOU ARE HAVING PROBLEMS, RUN FAR AWAY, AND SEEK HELP FROM SOMEONE WHO IS NOT INSANE. This individual is going to drag you down, not lift you up. That’s all people like this do; drag others down to their level. Tread carefully, as the path this person has gone down is a never-ending rabbit hole of questionable behavior. Who is giving you fits? All sociopaths are identical in the limited capacity of their minds and lack of emotional intelligence, and inability to operate normally in society – or even understand how to – because of the same non-functioning regions of their abnormal brains. There are extremely slight variations from one sociopath to the next only in the depth of drug use, prevalence of violence, level of what we’d consider sexual abuse and deviant sexual behavior, and the number of things they’ve done that are classified as crimes. – Other than that their minds function identically. So all sociopaths use drugs, are sexual abusers, and commit crimes now, too? You are a sick person. Seek help. You have no clue how the human brain functions. You are seriously humiliating yourself.